"Mesa is a Boxer / Lab mix (Boxador); mom was a boxer, dad was a chocolate Lab. She is great with kids and cats, loves to fetch, is very cuddly, and extremely athletic. She loves to go on mountain bike rides, hikes, and walks as much as possible. She always turns heads when we take her out, and usually gets comments from everybody who sees her. She is 1 year old, weighs 67 lbs., and is fairly shorthaired. She doesn’t shed much, and her hair is actually brown in the sun (usually looks black). We love her and think she is the best, not to mention an excellent specimen of the hybrid." Mesa (left) and her Boxador littermates, with Boxer mom and chocolate Labrador Retriever dad in the background. "This is my Lab / Boxer mix Sam at 6 months old weighing 55 lbs. Sam is a very active dog. He is a people dog. He loves everyone. He has been a bit of a handful to house train. He gets along great with cats and other dogs. Our cat Charlie's life has been much more active since Sam arrived. Sam is a spoiled farm dog. He spends all day at the farm riding four-wheelers and tractors, but comes home and is pampered nightly. He is a bit mouthy. He has this weird obsession with vegetables. Being on the farm he has access to the family garden and he steals vegetables all the time and eats them. I have watched the “Dog Whisperer” and have implemented techniques to stop Sam's barking. He barks uncontrollably at times, but this has easily been fixed with Cesar's tips." 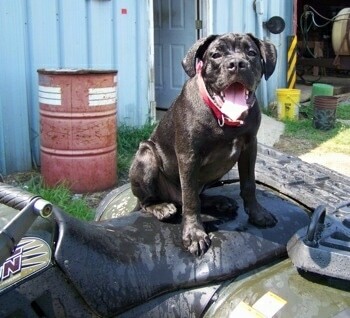 "This is a picture of my 29-month-old Boxador, Harry. His conception was accidental but fortunately both mama (white Boxer) and papa (black Lab) are purebred, and the litter found good homes very quickly as they were all so adorable. Often people doubt his lineage as he is extraordinarily larger than even the biggest Boxer or Lab, and due to his large head and slender body many people mistake him for a Great Dane. This picture was taken by me, over the Easter holidays; Harry is happily lounging on my boyfriend, Tom. Harry is both a loveable and loving character, demonstrating the best temperament traits of both breeds. He loves playing and is great with children but often doesn't know his own strength; even a strong wag of his tail can be unpleasant. He can also intimidate some people with his size. He can’t stand being alone (I think he thinks he's a person) and he often behaves like one, sneaking sips of coffee and insisting on riding in the front seat of the car. He is at his happiest when in company and being petted. He is so unaware of his size that he still tries to climb onto laps for a petting, as evident in the picture he's way too big for that but it doesn't stop him trying! His favorite way to play is chasing the streams of water from the garden hose (my plants have never been so well watered!) but he doesn't really get 'fetch.' He enjoys the fight to recover the stick from him way more than actually chasing it. Interestingly, Harry is a complete 50:50 mix of both parents. His coat is a lovely black and white pattern; all of his litter had beautiful markings. His head, eyes and ears are Lab-ish but his snout is shorter than an average Lab and he has the unmistakable Boxer jowls and mottled markings around his mouth and nose. His body is thick and sturdy like a Lab, but his legs are a little longer, and his belly tapers like a Boxer. His hind legs and his stance are signature Boxer and his tail is long and Lab-like. In hindsight it would have been a good idea to dock his tail as he is so large that he can be ungainly and his tail only exacerbates his clumsiness. As a pup he was far more like a Boxer but as he has grown and filled out he is a bit more chunky, Like a Lab." Shelby the Boxador puppy (Boxer / Lab mix breed dog) at about 3 months old—"Her mom was a Boxer and her dad was a Labrador Retriever. She is a sweet, funny dog who loves to get into things and play with people and other dogs."